The Breath of Avignon quilt is finally done! It will be on its way to its new home in the next few days, and I hope the bride and groom like it! It’s a late wedding present, but hopefully it was worth the wait…my mom would say better late than never. The bride and I are childhood friends, and we were also roommates in college. She always loved everything from France. Anytime I see anything that reminds me of Provence I think of her, so I chose the Breath of Avignon line for this quilt because it completely reminds me of her…just so fitting. 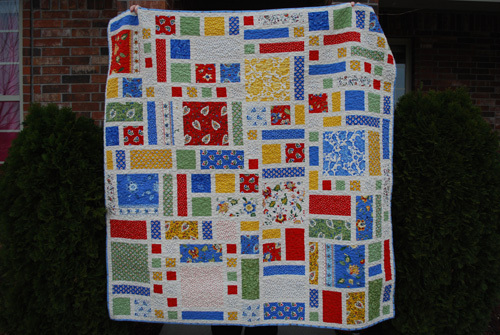 I used Carolina Patchwork’s Sweet Garden pattern. 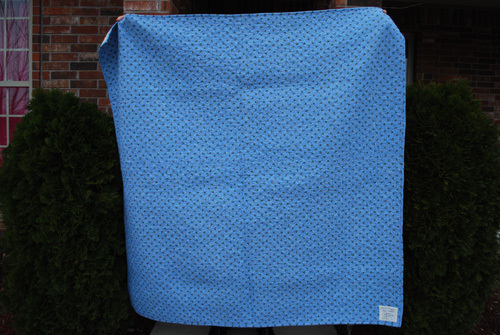 The pattern uses 1 layer cake plus some yardage, and I love how the pattern shows off the beauty of the entire line without feeling like it’s busy. That’s my biggest issue with many layer cake patterns…they feel busy to me, but in this pattern, the addition of the solid sashing is very pleasing and calming, and yet it allows the fabric line to stand out. The backing and binding fabric is not from the Breath of Avignon line, but it looks like it fits perfectly! I do love how it turned it! 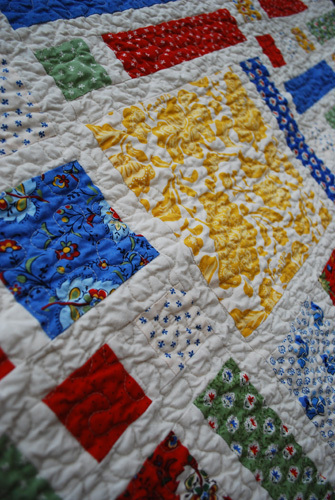 I feel like it’s been ages since I’ve sewed or quilted. With the kiddos back in school I thought I’d have so much free time, but it turns out that I’m more busy than before…strange how that works out! I love to play tennis, but at the end of June I got tennis elbow, and it’s painful. The real bummer is that sewing and quilting aggravates my tennis elbow, so until my arm starts to feel better, there won’t be much sewing going on. 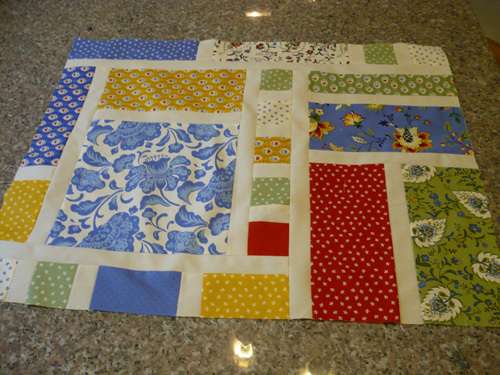 I did manage to get 2 blocks done on the Breath of Avignon quilt before my arm was screaming at me to stop. Looking back at the pictures makes me want to get started again, so hopefully I’ll be able to do that soon. I started a new project (I really shouldn’t have, but I couldn’t resist). I’m using a layer cake of A Breath of Avignon by American Jane for Moda. I so love the colors of this line, and this fabric line definitely brings me back to France…love it! 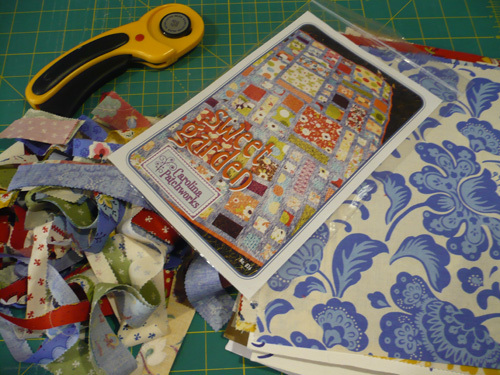 I’m using the Sweet Garden pattern by Carolina Patchworks. This pattern requires a good bit of organization and planning, so I organized my layer cake and then cut all the pieces. I then laid out the pieces to my liking. Now I just need to find the time to piece the top, but something tells me that this project is going to have to wait until July when I get back from vacation. 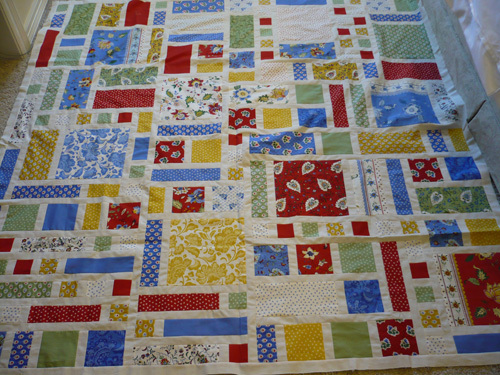 Before vacation I have so much work to do (you know for my part time job that actually pays me to do work), and I have to finish the binding on the 30’s Squared quilt. 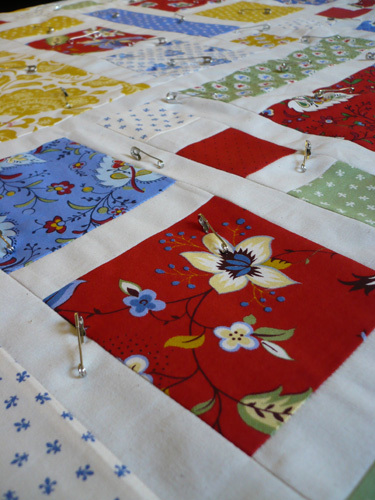 Oh, and I also have to finish the binding for the Black, White, & Red Allover quilt. 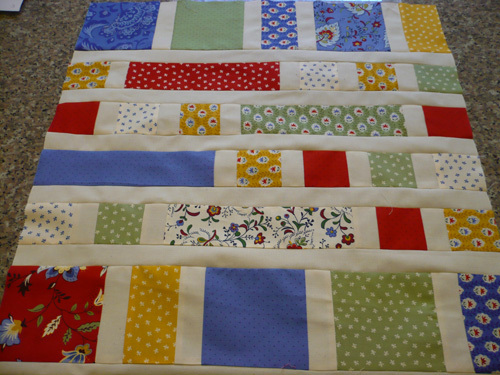 I think a baby quilt for a friend may also sneek in the to do list. Sheesh I have a lot to do!